As a Gamestar Mechanic designer, sometimes you may want to use a large number of the same sprite to create a line of turrets or a maze of blocks or whatever else. Simply placing the sprites in the right pattern is rarely enough detail for a well-structured game — you have to edit each of them with the Wrench tool, performing the same operation over and over for each sprite. Add a single sprite and edit it to your liking. You may want to test the game at this point to make sure that your sprite is functioning properly before you clone it. It looks like an eye dropper. Click the sprite from Step 1. The sprite appears on the cursor as though you’ve taken it from the sprite tray. 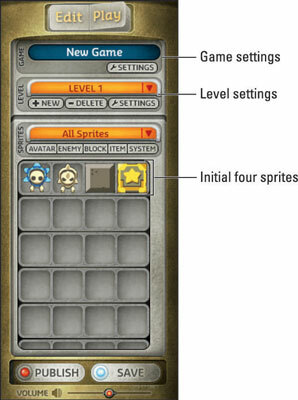 Select the square or squares you want to clone the sprite to. By clicking, or clicking and dragging, you can place clones of your sprite on different squares. If you want a line of pacing enemies, for example, copy the first one and drag it along the line. Put away the sprite by selecting a new tool or placing the sprite back in the sprite tray. If you’ve finished the steps and realize you made a mistake, that mistake has been copied to all your sprites. Rather than use the Edit tool to fix each one, use a similar cloning approach: Delete all but one sprite, edit the remaining sprite, and clone the sprite again with the change. If the sprites you’re placing are similar, but different in some way (such as facing in different directions), the Cloning method still applies. Create one sprite and edit it, and then clone it. Because the cloned sprites are halfway edited already, refining their behavior is much quicker and more efficient.